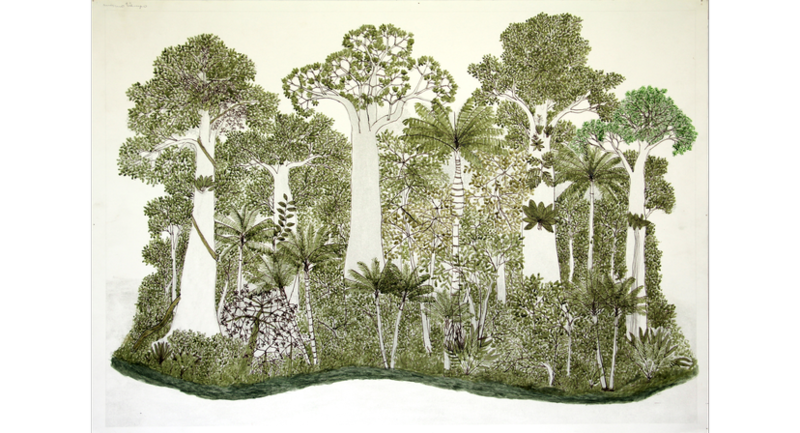 The work of Abel Rodriguez, an elder from the Nonuya community in Colombia, reflects an ancestral understanding of the indigenous plants and life cycles of the Amazon. For many years, he guided western scientists through the rainforest and has continued to share his intrinsic knowledge in a language of images, describing the intricately intertwined ecosystem of the rainforest around his people’s village. Rodriguez’s comprehension of the living landscape has parallels with holistic scientific approaches that offer alternative views to mainstream empiricism. Gäa refers to the personification of the Earth in Greek mythology and was a working title for Alexander von Humboldt’s major work which he later named Kosmos. Following his expedition through Colombia and the rainforests of Latin America, he described the earth as a living organism and all forms of life entangled in a fabric of relations. The works in this exhibition explore the traditional ecological knowledge that survives in indigenous cultures having developed through these people’s situated co-existence with particular places over millennia. Gemma Anderson’s experimental drawings emerge from collaborations with a cell biologist and a philosopher of science. Her practice has been inspired by Johann Wolfgang Goethe, a contemporary of Humboldt, whose phenomenological approach to natural philosophy proposed the practice of science as an art. A series of sound sculptures by Serena Korda draws on wisdom from a European worldview that had not yet been shaped by the scientific revolution and Delfina Muñoz de Toro’s visionary paintings and medicine songs are informed by her experiences living and working within ancestral cultures of the Amazon. The exhibition, curated by Gina Buenfeld, includes ethnographic textiles from the Shipibo and Huni Kuin peoples, both indigenous to the Amazon rainforest. 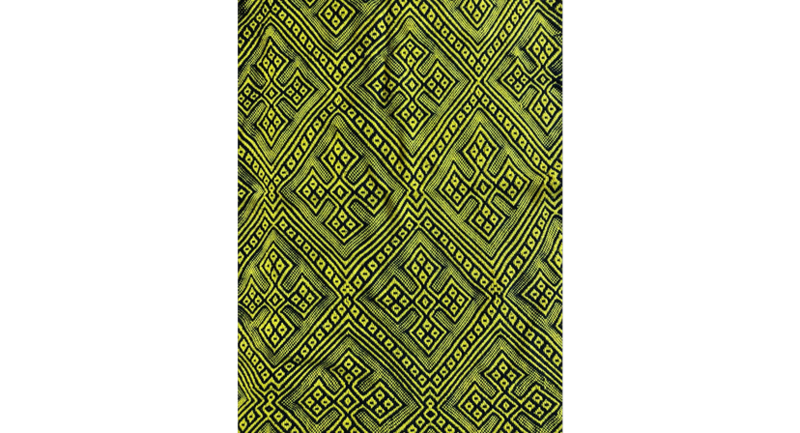 The embroidered and woven patterns are sacred geometries that represent the energetic form of natural entities in the jungle. The research and development of this exhibition was supported by the Arts Council England and the British Council. We would like to thank José Roca at FLORA ars+natura and Tropenbos International for their collaboration on this project, without which it would not have been possible to exhibit Abel Rodriguez’s work. The textiles of the Shipibo and Huni Kuin peoples are exhibited with the consent of the leaders and artisans of their communities and we would like to express our gratitude and appreciation for sharing their cultures with us.